Soup, Soup, glorious Soup! It has to be one of the easiest meals to prepare and one of my favourite Winter standbys. Simply wack everything into a pot, pour in some stock and let it simmer away until the delicious aromas begin tantalising your tummy juices. Thankfully my family isn’t fussy and puts up with pretty much anything I give them which allows me all kinds of freedoms in the kitchen that I know many of my friends aren’t able to enjoy. There are, though, a few occasions which stand out in my mind when my family have respectfully yet honestly asked that I not repeat a certain dish, but they are, thankfully, very rare. I’m not vain enough to think it’s my superior skills in the kitchen, not at all, more likely they’re happy with a warm, hunger-satisfying, healthy “something” at the end of the day. I get the warm fuzzies knowing they’ve enjoyed a meal I’ve lovingly prepared. And what’s not to love about something that takes anywhere between 15 and 30 minutes to make from start to finish? This past week the Sun Gods smiled on Auckland and we enjoyed almost a full week of gloriously sunny days, the no-cloud-in-the-sky type of Winter days that start off at about 1°C and only ever get to about 12°C if you’re lucky, but the crisp sunny freshness is enough to delight even the most grumpy among us and renew our faith that the wet winter will pass and the long warm days of summer will be upon us once again. I’ve been concentrating on buying seasonal produce and was amazed to discover I could buy 1kg of pumpkin for $0.79! I’ve also been focused on clearing out the pantry, using all those tins that stock up and making sure I don’t overlook any of the frozen items I’ve stashed away in the freezer before the freezer burn sets in and they are no longer the best quality. 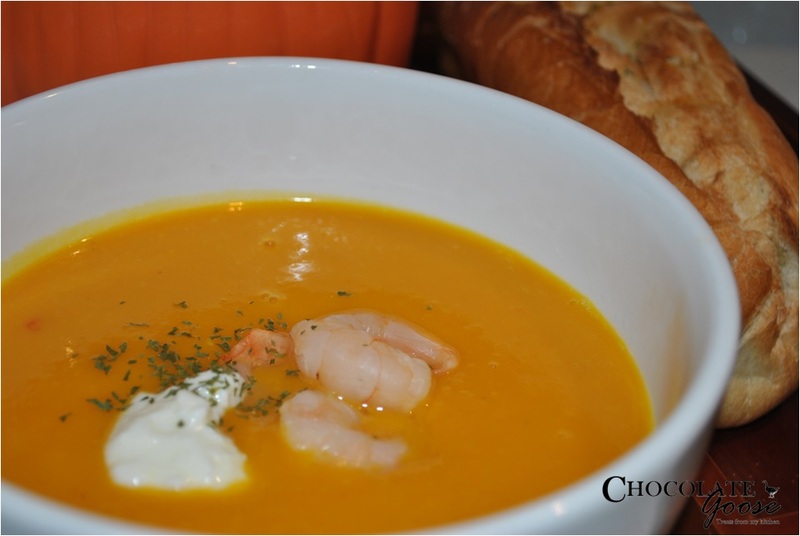 And this is how Prawn and Pumpkin soup came about. Well, to be honest, it reminded me of a recipe I saw a few years ago and knew I’d stashed somewhere, but it was easier to just use the idea and run with it instead of trying to locate the book I’d seen it in. And all that yellowy orange goodness just screams Sunshine and Happiness and warms the soul just looking at it. So the next few Chocolate Goose posts will be soup, soup and more soup. Heat the oil in a large pot and gently fry the onion, ginger and garlic (and fresh chilli if using) for a few minutes until the onion is translucent but the garlic mustn’t brown. Add the pumpkin and cook for another couple of minutes. Add the chicken stock and sweet chilli sauce (if using this instead of the fresh chilli) and bring to the boil. Reduce the heat slightly and simmer for about 15 minutes until the pumpkin is tender. Pour in the coconut cream and fish sauce and add most of the prawn cutlets, reserving a few to use as garnish. Simmer for a further 5 minutes. Remove the soup from the heat and puree in batches in a blender. You may need to reheat the soup by returning to the pot for a few minutes. Serve in bowls garnished with the remaining cooked prawn cutlets, a dollop of yoghurt and the finely chopped coriander leaves. Serve with the freshly warmed garlic bread.